What’s needed to plug a $2 trln investment gap for U.S. airports, roads and such isn’t taxpayer cash. It’s the removal of hurdles to private financing and a change in the mindsets of authorities and consumers. There are good ideas to borrow from the likes of Canada and Australia. 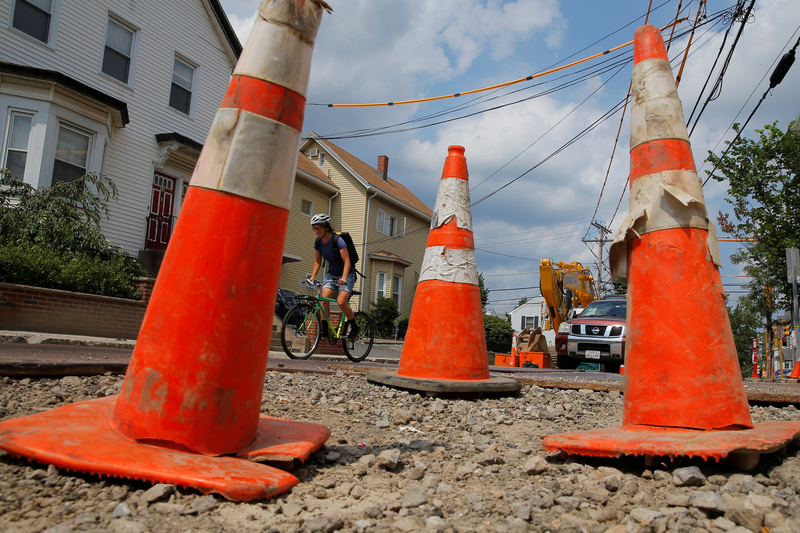 A bicyclist and a driver make their way over steel plates covering a portion of Cedar Street during a years-long water main and sewer renovation project under the street in Somerville, Massachusetts, U.S., August 4, 2017. The American Society of Civil Engineers graded U.S. infrastructure D-plus in the 2017 edition of its quadrennial report card. Overall, the ASCE identified $4.6 trillion of funding needs between 2016 and 2025, of which $2.5 trillion is expected to be covered under existing spending plans but $2.1 trillion is not. President Donald Trump is set to sign an executive order on Aug. 15 "establishing discipline and accountability in the environmental-review and permitting process for infrastructure projects," the White House said in a statement on Aug. 14.